I wonder why java.util.ArrayList allows to add null. Is there any case where I would want to add null to an ArrayList? I am asking this question because in a project we had a bug where some code was adding null to the ArrayList and it was hard to spot where the bug was. Obviously a NullPointerException was thrown but not until other code tried to access the element. The problem was how to locate the code that added the null object. It would have been easier if ArrayList threw an exception in the code where the elements was being added. This design decision appears mostly driven by naming. Name ArrayList suggests to reader a functionality similar to arrays - and it is natural for Java Collections Framework designers to expect that vast majority of API users will rely on it functioning similar to arrays. arrayList.set(0, null); // NPE => WTF? If you would want a List implementation disallowing nulls, it would better be called like NonNullableArrayList or something like that, to avoid confusing API users. Side note there is an auxiliary discussion in comments below, along with additional considerations supporting the reasoning laid out here. if you don't want to allow nulls to be added then you could wrap the array list with your own wrapper which threw when null was added. "[ArrayList is a] resizable-array implementation of the List interface. Implements all optional list operations, and permits all elements, including null." The answer to "why" is that if it didn't the ArrayList wouldn't be usable in cases where it is necessary to put a null in the list. By contrast, you can prevent an ArrayList from containing nulls by either testing values before adding them or using a wrapper that prevents this happening. Is there any case where I would want to add null to an ArrayList? Obviously, any case where null has a distinct meaning. For instance it might mean that the value at a given position in the list has not been initialized or supplied. It would have been easier if the ArrayList had thrown an exception in the code where the elements was being added. You could easily implement that behaviour by creating a wrapper class. However, this is not the behaviour that most programmers / applications need. If you guys have a contract that there never should be nulls in a container then it's up to you lot to make sure that contract is upheld, probably most appropriately by asserting. It would probably have taken you max 10 lines of code. Java makes it incredibly easy for you to do this sort of thing. The JDK cannot read your mind. This seems to be more of a (software-)philosophic question here. ArrayList as a utility class is designed to be helpful in a wide context of possible use-cases. Contrary to your hidden claim that accepting null as a valid value should be discouraged, there are many examples where the null value is perfectly legal. The single most important reason is that null is the do not know equivalent of any reference type, including framework types. This implies that null cannot be replaced in any case by a more fluent version of the nothing value. So, lets say you store the Integers 1, 3, 7 in your arraylist at its corresponding index: Due to some computation, you want to get the element at index 5, so what your array should return is: "no value stored". This could be achieved through returning null or a NullObject. In most cases returning the built in null value is expressive enough. After calling a method that can return null and using its return value a check of the returned value against null is quite common in modern code. is valid and useful (I don't think I need to explain why). It is likewise useful to have a collection of files, some of which may be null. The usefulness of collections that may contain null objects proceeds directly from the usefulness of objects that may be null. It is really as simple as that. It is easier to accept everything, than to be to be restrictive and then try opening up your design after the fact. For example, what if they oracle/sun provided only NonNullableArrayList, but you wanted to be able to add a Null to your list. How would you do it? You would probably have to create an entirely different object, you couldn't use extend the NonNullableArrayList. Instead if you have a ArrayList that takes everything, you could easily extend it, and override the add, where it doesn't accept null values. Not the answer you're looking for? 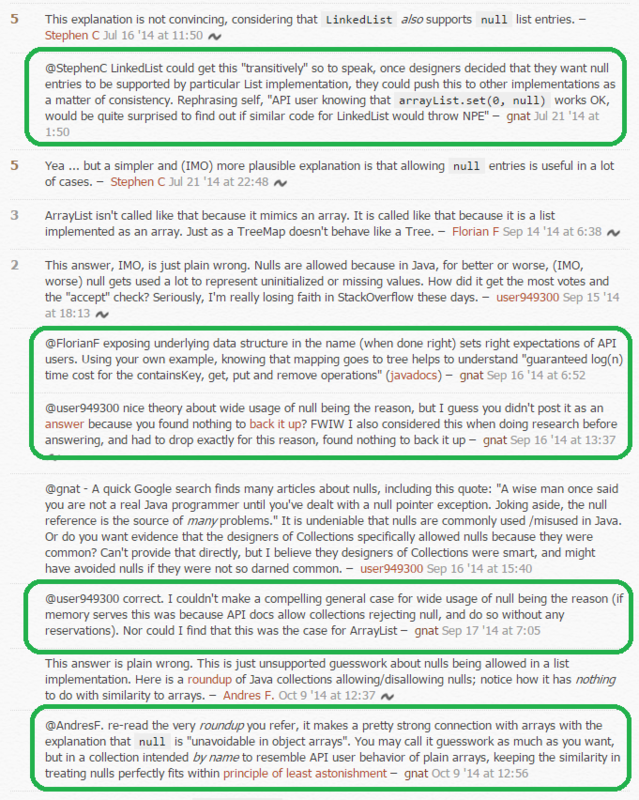 Browse other questions tagged java api-design collections or ask your own question. Why do arrays in Java not override equals()? Why is the hashCode method usage of HashSet not specified in the API? How do I use checked exceptions without violating the Law of Demeter? Readability & Performance: Is it better to allow the Java garbage collector to clear a datastructure? Why were Null-Safe Operators (e.g. “Elvis operator”) rejected as part of Java 7's “Project Coin”?